The PADI Open Water Diver course is one of the most popular scuba diving courses, and Bali is one of the most popular diving destinations. In this tropical paradise, you'll spend three days and undertake four open water dives to explore the gorgeous Bali Sea. Before your dives, you'll prepare with theory lessons covering five specific modules and practice with pool training sessions at the dive center. Accompanied by a certified dive instructor, you'll quickly pick up the essential skills of scuba diving and earn your PADI Open Water Diver certification. This scuba diving course in Bali takes you to the gorgeous dive spots near Amed in Bali. These dive spots, with minimal ocean current and moderate water temperatures, are perfect for amateur scuba divers completing their first open water dives. The most well-known locations in these waters include the Jemeluk Bay, a shallow and rich coral garden, the Jemeluk Wall, an impressive abyss in the Bali Sea, and the Deep Blue, a shallow bay of coral boomies. From schools of barracudas and moray eels to black tip reef sharks and sea turtles, these dive spots of Amed feature a widely diverse marine life. • Explore dive spots with a range of fascinating marine life and vibrant reefs. • Earn your PADI Open Water Diver certification. For cancellations made between 7-30 days before the start of your scuba diving course in Bali: 50% refund. For cancellations made less than 7 days before the start date of your scuba diving course in Bali: no refund. Pick-ups and drop-offs can be offered only for travellers staying at hotels or places of accommodation in the Tulamben or Amed areas. Before beginning the course, all travellers will be expected to pass a test requiring them to swim for 600 feet/200 meters and float for 10 mins. 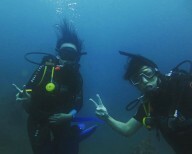 On the first day of your scuba diving course in Bali, you'll begin with extensive theory lessons. 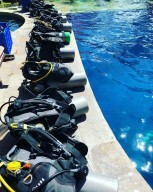 A certified dive instructor will take you through different modules that explain the principles and basics of diving. You'll watch a few videos and learn essential skills. This is followed by pool training sessions that'll teach you to apply the theory. 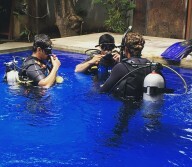 In a shallow swimming pool, you'll practice different skills in the company of a certified dive instructor until you feel confident in your abilities. The day's session ends by late afternoon. You can spend the rest of your day at leisure. Practice your abilities in a swimming pool before entering the ocean. After a day of theory and pool training, you'll take the step forward and embark on two open water dives. You'll head out from the island to specific dive sites and swim down 40 feet deep with your dive instructor. You'll focus on developing essential skills like how to breath and communicate underwater and how to swim deeper with your scuba gear. You'll also explore a wide array of the marine life, from crabs to sea turtles, and admire gorgeous views of reefs and corals covering the dive site. The day's session ends by late afternoon. You can spend the rest of your day at leisure. 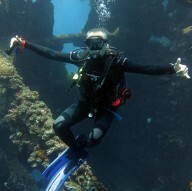 With the confidence of two open water dives, you'll once again head out from the island for two more open water dives. This time, you'll focus on cementing your skills and swimming to depths of 60 feet. You'll work with your dive instructor to complete various tasks in the water that demonstrate your mastery of the basic skills. At the end, you can take some time to simply relax and explore the fascinating topography of the ocean floor. Back at the dive center, you'll end the day's session with a short written exam and the paperwork to receive your certification. Your trip ends here. Spot multi-coloured fishes swimming in the corals and reefs of Bali.